Austrian poet; born at Przibram, Bohemia, Oct., 1821; died at Oberdöbling, near Vienna, May 13, 1872. He was educated at the gymnasiums at Jung-Bunzlau and Prague, and at the universities of Prague and Vienna. After traveling in Italy, Switzerland, Germany, and France he went to Vienna (1842). He revisited Germany in 1844, and lived for some time after in Brussels. In 1847 he returned to Prague. He took part in the Revolution of 1848, and was elected representative to the Parliament at Frankfort-on-the-Main. He went with Blum and Fröbel to Vienna, escaping to Frankfort when the troops under Windischgrätz were victorious. When the revolution in Baden broke out (1849) he again sided with the revolutionists, and when this revolution also failed he was compelled to flee from Germany. In 1853 he was sent to the Crimea as war correspondent for the "Kölnische Zeitung." Expelled from Constantinople in 1854, he went to France. In 1860 he settled in Geneva, where he became teacher of German literature and language. 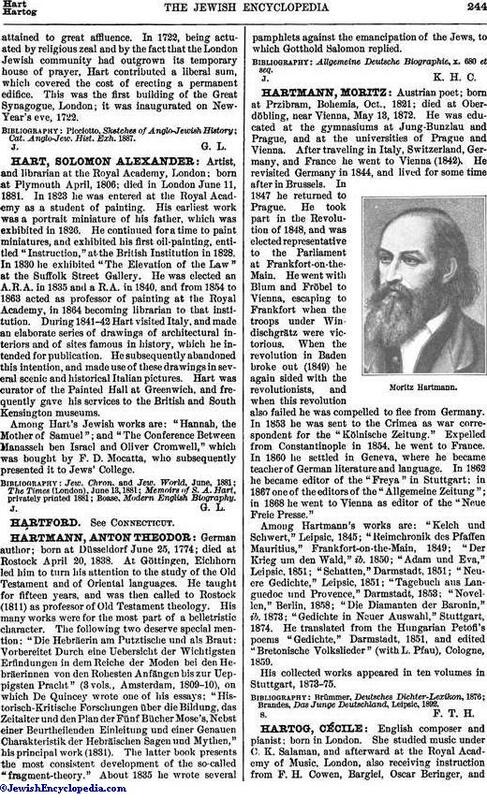 In 1862 he became editor of the "Freya" in Stuttgart; in 1867 one of the editors of the "Allgemeine Zeitung"; in 1868 he went to Vienna as editor of the "Neue Freie Presse." Among Hartmann's works are: "Kelch und Schwert," Leipsic, 1845; "Reimchronik des Pfaffen Mauritius," Frankfort-on-the-Main, 1849; "Der Krieg um den Wald," ib. 1850; "Adam und Eva," Leipsic. 1851; "Schatten," Darmstadt, 1851; "Neuere Gedichte," Leipsic, 1851; "Tagebuch aus Languedoc und Provence," Darmstadt, 1853; "Novellen," Berlin, 1858; "Die Diamanten der Baronin," ib. 1873; "Gedichte in Neuer Auswahl," Stuttgart, 1874. He translated from the Hungarian Petofi's poems "Gedichte," Darmstadt, 1851, and edited "Bretonische Volkslieder" (with L. Pfau), Cologne, 1859. His collected works appeared in ten volumes in Stuttgart, 1873-75. Brandes, Das Junge Deutschland, Leipsic, 1892.